From 15 to 29 : 0,66€ discount on the price indicated. From 30 : 1,00€ discount on the price indicated. 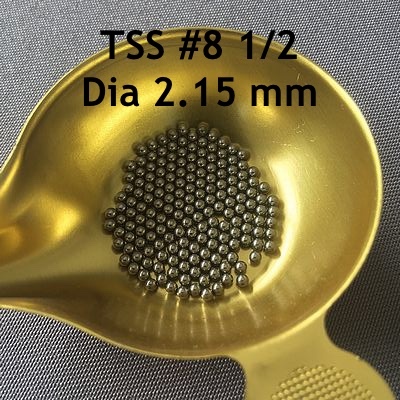 The TSS #81/2, diameter 2.15 mm is a very interesting ball. It is the lead equivalent of a ball of 4 at the level of the penetration which makes it a ball well adapted to shots distance because of its important lethality. TSS # 81/2 (2.15 mm) balls can be used to shoot medium and large ducks up to a distance of at least 60 m. Indeed, the 37 mm (necessary for the mallard) entrance is reached up to 70 m and the 60 m average pattern density remains of almost 4 impacts per dm² for a conventional 40 gram load. I invite you to go on the blog to consult the table of the loads according to the desired game.